French capital to unveil reworked site crowned with one of the most ambitious architectural projects of the decade, reports The Guardian. Les Halles is an area of Paris, France, located in the 1er arrondissement, just south of the fashionable rue Montorgueil. It is named for the large central wholesale marketplace, which was demolished in 1971. The wholesale market was relocated to the suburb of Rungis in 1971. Les Halles gained an underground station for the RER, a network of new express underground lines which was completed in the 1960s. Five metro lines and three suburban train lines now meet at this location. 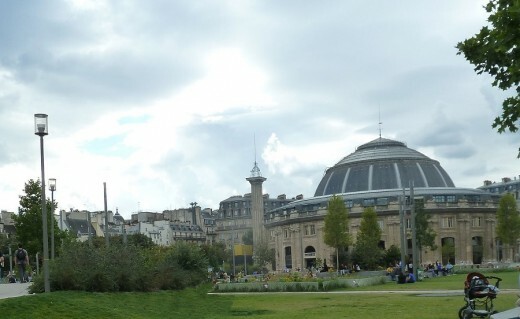 For several years, the site of the markets was an enormous open pit, nicknamed “le trou des Halles” (trou = hole), regarded as an eyesore at the foot of the historic church of Saint-Eustache. 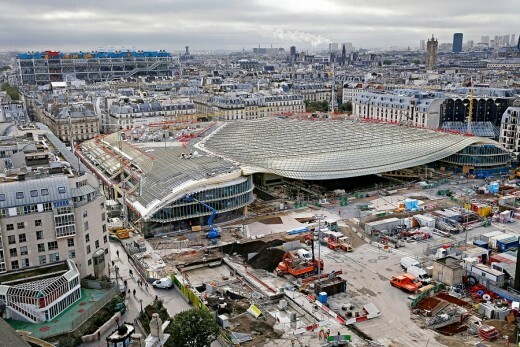 Construction was completed in 1977 on Châtelet-Les-Halles, Paris’s new urban railway hub. The Forum des Halles, a partially underground multi-story commercial and shopping center, completed at the end of the seventies, though the (former) Mayor Jacques Chirac only cut the ribbon in 1981. One of the city’s red-light districts extends along the eastern boundary of les Halles, along the Rue Saint-Denis. Les Halles also includes Musée Grévin – a wax museum in the Forum des Halles. Les Halles was the traditional central market of Paris. In 1137, Louis VI le Gros created an open air market in the vicinity of les Halles. In 1183, King Philippe II Auguste enlarged the marketplace in Paris and built a shelter for the merchants. In the 1850s, massive glass and iron buildings (by architect Victor Baltard) were constructed. 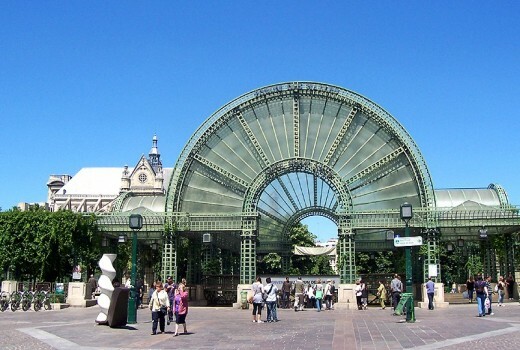 Les Halles was nicknamed “the belly of Paris” by Emile Zola. A proposal to remake the park was approved in 2004. Les Halles is unpopular partly due to defective and ugly design and partly due to the drug pushers and gangs that hang out in the area. Redevelopment work has been delayed after a group of residents appealed against the destruction of the much-loved Lalanne garden, a mature garden with around 343 trees. The current proposals – a vast and undulating glass roof – are designed by French architect Patrick Berger.